Glad to be a Girl: What a Prize! Mkay, so believe it or not, I was actually going to kick of The First (proper) Turkey 2014 post today ... but then something else happened ... so maybe tomorrow, okay? So, maybe you didn't know it (I didn't before) but apparently February is Pregnancy Awareness Month. If you've been reading a while, you'll be aware that I am pregnant. So obvs this ended up on my radar for the first time ever. It's also apparently Pregnancy Education Week (10 to 22 February 2015). Apparently only about 5% of pregnant women in SA do a formal / private antenatal course. Which I was kind of surprised about ... we got a voucher for free Antenatal classes (along with a voucher for a free 4D scan when we did our pre-admittance to hospital, a Mediclinic). We happen to have chosen not to go to the Antenatal classes offered by our hospital, so we are paying extra for ours ... but that's because of convenience. We didn't want to do it all in one day session and there is a much closer hospital (it's a Netcare so we couldn't use the voucer) to our house (which we're not using for the birth because my gynae works out of the other hospital - I'm pretty sure I'm not the only person in this scenario). So we are going to 2 hour classes one evening a week for 6 weeks. Apparently we can also claim some of this back from Medical Aid, but we'll see what happens when we try. I've heard mixed reviews from people who have done Antenatal classes, some loved it and some thought it was a waste of time ... we're only 2 classes in, and so far I'm glad we're going. Some of it makes me realise why you only do it in your third trimester ... because it's too late to change your mind about having this kid now (we did all the types of contractions this week o_0). But mostly it is good just to feel like the more you know and prepare yourself the calmer you feel. Chances are slim you'll need everything you learn or hear about because the resounding comment on pregnancy seems to be "it may happen, it may not" about EVERYTHING ... except, of course, that you are growing a child. That seems to be pretty much the only constant across every woman's experience. The other thing we did was visit with a lawyer just to make sure there was nothing we didn't know about staying unmarried while raising a child together. Anyway. One of the other things on our list to do was to do a hospital visit. They do tours for expectant moms & partners every Wednesday at 10h30 (this probably differs per hospital). I was dreading this, just from the added time I'd have to be off work on top of all the gynae appointments I already have, since it's right in the middle of the day. But when we had our 4D scan, they told us that they were having 3 evening open days, doing the tour with a lucky draw and plenty of relevant exhibitors (UIF people, stem cell people, breast pump reps etc.). So that suited us much better and we made a (mental) note to go then. On Tuesday, sitting at our Antenatal class, we realised that was this week and we'd intended to go on Monday evening but completely forgotten. Obviously we couldn't make Tuesday evening either as we were at classes already. So last night it was! It was nice to go and see and get talked thru where you'll be and for what and how it all works. We got a look in a private and a luxury room. I had already selected a preference for a private room on my pre-admittance so it was really cool to see what it was like. My reaction on seeing and hearing about the luxury suite was "Are they here for a holiday or to have a baby?". 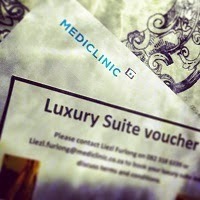 Each room, as you move up from general (covered by medical aid) comes with an additional fee. Anyhoo, after the tour, we all headed back downstairs for the lucky draw. There were loads of prizes: hampers and vouchers and all sorts of cool things, leading up to the main prize of a luxury suite. I had a feeling if we won anything it'd be something like a Bio Oil hamper (which I already had) or a voucher for the CPR course (at the same place I've already booked with and paid for) because Murphy's Law. We didn't win anything ... and then they threw all the names back into the hat for the Big Prize. I wasn't even paying attention (I had taken out my phone to check the time), but The Trucker shrieked when they called out my name! OMG. That is right folks, we won the Luxury Suite. How freaking insane is that? The Trucker gets a proper bed to stay overnight in and his meals are included as well! The room is the size of our lounge and there is an insane private bathroom. We also got a cool goodie bag on the tour (a bonus that I don't think you get on the regular weekly ones). That's another thing that amazes me! All the free stuff people give you when you're pregnant. So far we've had a Discovery Baby Bag (when you're 12weeks+) and a Dischem Baby Bag (when you're 28weeks+). Then last night we heard that you get another bag at Mediclinic when your baby is born with all the toiletries your newborn needs, newborn nappies and a few extras for mom. So all you need to bring for your baby is clothing! That's awesome! lucky, lucky you, will make the whole experience so much better. The luxury suite was a lifesaver for me! We had not booked it but I had a rough delivery and was on a catheter and a drip and my SO was amazing with the baby for the two nights we were there. I could not really walk well and would have struggled with the little dude. IT is an awesome bonding experience and I wish all families could afford it. May I ask what you learn at your classes? I went to classes specifically for people who are fixed on vaginal birth. I had hoped for some education on how to care for the baby but our classes were all birth oriented. Are yours baby oriented too? Cool that sounds useful. So far I have used youtube and babycenter for everything from how to pick up a baby to how to bath them. Love the Internet.